THYMOS® Anti HFMD/FLU Sprays™ is a high-powered disinfectant specifically designed to help mothers provide an all-round total defence for their little one by eliminating 99.99% Virus infectious diseases. The sprays is a quick, yet long-lasting solution to unclean surfaces. That’s part of what makes it perfect for our modern time. 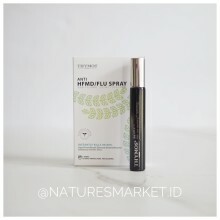 The spray comes in a travel-size tube and can fit easily in your purse or in your desk drawer & forget about repeated sanitising to ensure the surrounding of your little one is free from infectious disease.